One of my favorite summer vegetables is the zucchini also known as courgettes or summer squash. They are one of my favorites both because I like them and because they are always nice and cheap while in season. This weekend I finally noticed the locally grown zucchini at the farmers market and I picked up a bunch of them already knowing what I wanted to make first. I had come across a recipe for a summer squash and farro gratin on Cooking with Michelle that combined the zucchini with a whole grain. 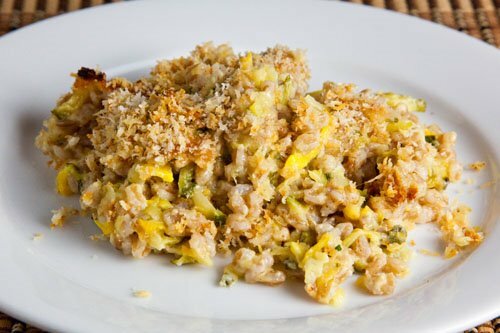 I have really been enjoying whole grains lately and I liked the sound of combining the zucchini with the farro, and the melted cheesy goodness was just the icing on the cake. Sometimes I find myself worrying about the size of ingredients and this time I was thinking that it would be nice if the zucchini was cut to a size that was similar to that of the farro. Since farro is pretty small I decided to just grate the zucchini which also ended up being a lot easier than dicing it. Since the zucchini was grated into such small pieces I figured that I could just add it to the gratin without sauteing it first. I went with equal parts green and yellow courgettes to add some extra colour in the dish. Having to cook the farro, make the bechamel sauce , saute the onions and finally bake the gratin took a bit of time but it was pretty easy and the results were well worth the effort. The zucchini and farro gratin turned out really well! It was nice and creamy and ooey gooey and cheesy and good. The grated zucchini worked really well in the gratin and the farro added nice chewiness while the panko topping brought a nice crunch to finish it off. Despite the fact that is served this as a side dish I went back for seconds! I had a jar of salsa that needed finishing and I tried serving it on the leftover zucchini and farro gratin and it worked surprisingly well adding a nice touch of heat. What a great start to zucchini season! Add the garlic and saute until fragrant, about 1 minute and set aside. Whisk in the flour and continue whisking until if turns a light golden brown. Whisk in the milk simmer until it thickens. Mix the onions, white sauce, zucchini, farro, parmigiano reggiano and gruyere and season with salt and pepper. Pour the mixture into an 8 inch square baking pan and top with a mixture of bread crumbs and parmigiano reggiano. Bake in a preheated 350F/180C oven until golden brown and bubbling, about 30 minutes. I love it, Kevin! Zucchini like this would be great! Hi, just stumbled upon yr blog. All yr food looks really adventurous and fantastic! You have made farro once or twice before, haven't you!! I'll have to use brown rice, though!! I like the gratin idea to give even more crunch to this dish!!! sounds lovely…must try this..u think broken wheat would instead of the brown rice ? Thinks looks delish. I have some zucchini and squash to use up and I know I'd love this. I'm going to try with quinoa. A perfect combo! I love farro! My neighbor just brought me a bunch of zucchini…now I know what to do with it. Thats so healthy and love the zucchini in it! This looks to me almost like faro and zucchini mac and cheese. You really can't get better than that! This is the first time I see a recipe using Farro (Not common in Aus)- Learned something new today! Deliziosa questa tua ricetta, complimenti anche per il tuo blog ricco di contenuti. I love gratins because they are the ultimate comfort foods and this one is actually good for you! Awesome! I would guess the cheese makes all the difference. I only use farro flour, I have never eat it as a whole cereal. I have to try your recipe because it sounds so yummy and… fondant! Mmm… cheese and zucchini and gratin — everything wonderful in one dish! Arch: I have not had broken wheat but it looks like it would work. I am going to have to look for some now. So happy to see some farro. We had it at a food fundraiser a couple of weeks ago, and it was too good. Wow this looks delicious! Anything with a crusty topping is bound to be good. I've seen a lot of great farro recipes lately, I'll have to keep my eye out for the stuff. My current favourite ingredient is zucchini and this is a great way to enjoy it! yum yum! This looks delicious-I can't wait to try it! I hope its ok that I added a link of your cooking blog on my own that I just recently started…I think you're great! I was traveling when you posted this so didn't see you had made my recipe – glad you enjoyed it!